In your mayoral acceptance speech this past November, you pledged to turn Cincinnati into a more inclusive city; a city where government can find solutions that will bring disparate groups together while building communities that work for everyone. It is an admirable sentiment, but, as an alcoholic and addict who is a part of this city’s exceptional recovery community, I must say that your recent actions concerning New Foundations Transitional Living can only undermine the lofty goals you voiced on election night. When I heard that the city of Cincinnati had requested an injunction to shut down 7 transitional sober houses in Price Hill, my initial reaction was one of utter disbelief at the notion that my hometown would kick 120 recovering men and women to the curb because of a regulatory snafu. Once I had thoroughly wrapped my head around the idea that my city’s government was trying to needlessly eliminate recovery services when almost all of the major treatment centers in the Greater Cincinnati area have extensive waiting lists, my disbelief turned momentarily into rage, which then turned into sadness that has been with me ever since. 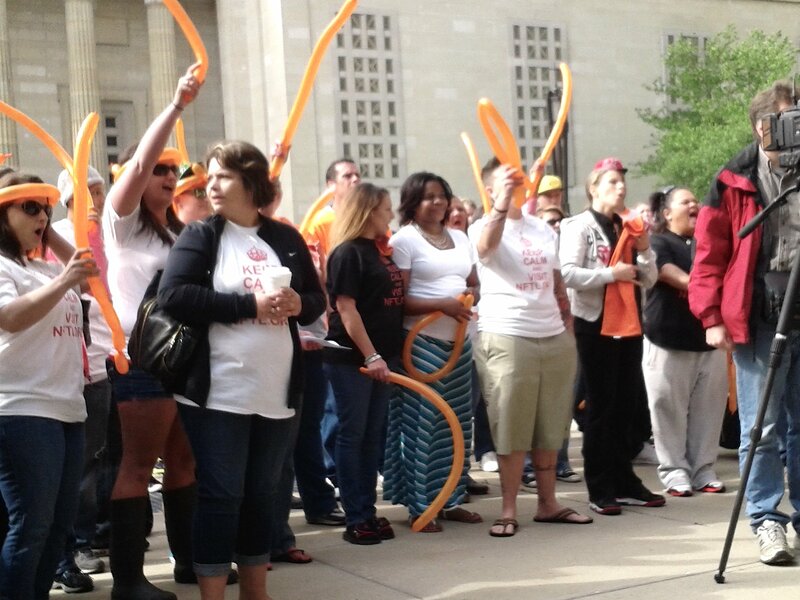 Supporters of New Foundations Transitional Living at a Rally Outside of City Hall on May 5th. Mayor Cranley, I cannot presuppose any knowledge of the suffering and heartache that you have endured throughout your life; I can only hope to convey to you the severity and tenacity of that particular type sadness that is cultivated in the chambers of your heart when you see your friends and loved ones slogging through the morass of active addiction. It’s the sort of sadness that makes your soul sag down into your gut like some inoperable, invisible ulcer that can only be treated with time and distance. For the non-addict and non-alcoholic, the sadness is compounded by the inability to comprehend the self-destructive impulses of the ones they love. However, those of us in recovery understand those impulses all too well and view them with the knowledge that there but for the grace of God go we. It is not hyperbole to say that, for people like us, places like New Foundations Transitional Living can be the difference between life and death. And, considering the fact that the heroin epidemic has gotten so bad in most counties in Southwest Ohio and Northern Kentucky that they can’t provide accurate statistics for how many addicts have died in 2014 because the corpses have been coming in so fast that the coroners still have a 3 month backlog of toxicology reports to go through. Over the past six months, I’ve had the privilege of going to several 12-step group meetings that residents of New Foundations Transitional Living sober houses regularly attend and I can tell you that they have helped me out in ways I can hardly articulate. If there is a diametric opposite to those feelings of sadness and despair I described above, it can be found in the rooms of an Alcoholics Anonymous or Narcotics Anonymous meeting when men and women like the ones who call New Foundations their home share their lives and their stories with the rest of us. To see young men and women—some of whom are fresh out of high school—trying to sever the grasp that active addiction had on their lives is truly a remarkable thing, especially considering the environment in which they came of age. I’m only 27 years old and I can’t remember heroin as being anything more than an occasional blip on my radar screen when I was drinking and drugging in high school and college. Just in the last 3 or 4 years, the presence of Rx painkillers and heroin in Cincinnati and Northern Kentucky has accelerated at such a rate that an opiate world is the only one some of these young men and women have ever known. It’s astonishing and horrifying to listen to 19 and 20 year olds talk about overdosing as casually as non-addicts would talk about getting a traffic ticket; to hear people in their early 20s tell you that they could be attending funerals at least once every couple days because their friends are dying so fast. I cannot speak to whether or not New Foundations is in the right or in the wrong when it comes to Cincinnati zoning laws and the Fair Housing Act, but I don’t believe I need to. These injunctions and temporary restraining orders are nothing more than window dressing for the real issue, which is that a small group of Price Hill residents don’t want to live next to a house full of addicts and alcoholics in recovery. Don’t think it isn’t lost on the people of Cincinnati that the zoning issues were only brought up after New Foundations had the gall to try and open up a property in a more affluent part of the neighborhood or that Pete Witte, one of the spearheads of the movement to kick New Foundations out of Price Hill, was such a big supporter of your mayoral campaign that he appeared in one of your ads. You wanted to build an inclusive city where everyone gets a seat at the table, Mayor Cranley? Well, here’s your chance. Let’s see what you’re made of. Well said. Thank you for the courage to address Mayor Crawley directly!